KenClean Plus mat disinfectant and cleaner is used to clean and disinfect your mat, but won't harm your mat's finish. 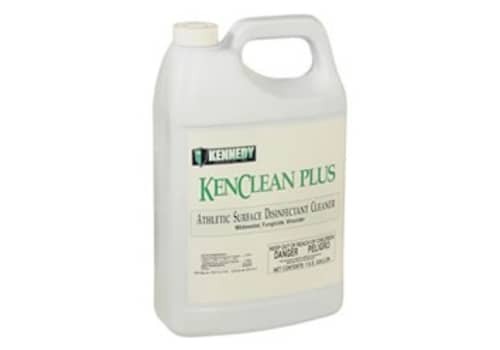 Kenclean Plus was formulated to be cost effective and easy to use. Just 2 ounces of KenClean Plus per gallon of solution not only cleans your mats but also disinfects them. If three gallons of water are used to clean your mats, then you would add 6 ounces of KenClean Plus per cleaning. Not all wrestling mat disinfectants are created equal. Make sure yours kills the *viruses, bacteria and fungi that can cause health problems. KenClean kills the following: HIV-1 (AIDS) Virus. Herpes Simplex Type 1. Staphyloccus Aureaus. Strephtoccus Faecalis. Streptoccus Salivarius. MRSA. Trichophyton Mentagrophytes (Causative agent responsible for RINGWORM). Refer to label for additional benefits. For effective protection must be used in accordance with instructions on label. Not all wrestling mat disinfectants are created equal. Make sure yours kills the *viruses, bacteria and fungi that can cause health problems. For effective protection must be used in accordance with instructions on label. 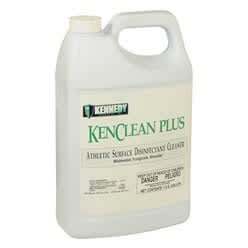 Kenclean Plus was formulated to be cost effective and easy to use. Just 2 ounces of KenClean Plus per gallon of solution not only cleans your mats but also disinfects them. If three gallons of water are used to clean your mats, then you would add 6 ounces of KenClean Plus per cleaning. Also available in pre-diluted, ready-to-use spray containers.